The Nigerian Army has confirmed that the Chief of Army Staff, Lieutenant General Tukur Yusufu Buratai own two properties in Dubai which he paid for under instalmental arrangement long before he became the army chief. 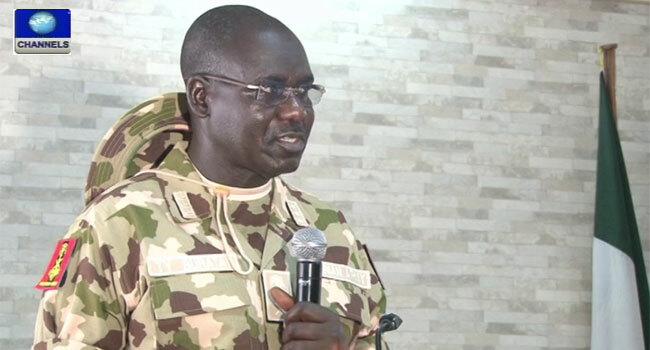 A statement by the Acting Director Army Public Relations, Colonel Sani Kukasheka Usman, obviously reacting to media report, said that the Buratai family have two properties in Dubai that were paid for instalmentally through personal savings three years ago. “This, along with other personal assets, has consistently been declared by General Buratai in his Assets Declaration Form as Commander Multinational Joint Task Force Commander and as Chief of Army Staff. Colonel Sani Usman said that the General has not been involved in any form of shady or dishonest transaction, not to talk of “contract scam,” saying: “General Buratai was never near either Defence Headquarters or Army Headquarters in 2013. “The attention of Nigerian Army has been drawn to another round of campaign of calumny against the Chief of Army Staff, Lieutenant General Tukur Yusufu Buratai and his family by some unscrupulous elements as contained in Sahara Reporters story titled “Revealed: Buhari’s Chief Of Army Staff, General Buratai, Wives Own Dubai Property”. They alleged that Nigeria’s Chief of Army Staff (COAS), General Tukur Buratai, and his two wives are joint owners of a Dubai property that was paid for in one transaction posted on the website. It is important to know that these baseless allegations were not new. In March this year, some groups of individuals under the aegis of “Concerned Citizens” tried same smear campaign to their disappointment. It could not fly, because it is not true. You will recall early this week, there was similar campaign of calumny by yet another online news medium, The Cable. Therein, among other things, it alleged that wounded in action Nigerian Army personnel were abandoned by the Army, government and the nation which is not true. Therefore, the latest round of smear campaign by Sahara Reporters is one of the series of campaigns of calumny by these faceless individuals to malign the Chief of Army Staff and the Nigerian Army. Yet, typical of blackmailers and mischief makers despite failures, they did not give up, hence they now found a willing accomplice reputed for muckraking like the Sahara Reporters. The online news medium this evening uploaded another campaign of calumny allegedly based on a petition by obviously fake and non-existent group it described as “Concerned Soldiers and Officers From the North East”. The allegations contained in the Sahara Reporters write up are baseless and not correct. It is a fact that the Buratai family have two properties in Dubai that were paid for instalmentally through personal savings three years ago. This, along with other personal assets, has consistently been declared by General Buratai in his Assets Declaration Form as Commander Multinational Joint Task Force Commander and as Chief of Army Staff. It is pertinent to state that the Chief of Army Staff does not have any account with Skye Bank as alleged, let alone making deposits in the imaginary bank account to the tune of the amount stated in the write up. Similarly, he has not been involved in any form of shady or dishonest transaction, not to talk of “contract scam”. In addition, General Buratai was never near either Defence Headquarters or Army Headquarters in 2013. It is pertinent to also note that he was never a Director of procurement in Army Headquarters as alleged. As a matter of fact, the Nigerian Army never had a Directorate of Procurement till when he established one last year when he became Chief of Army Staff. In a bid to rubbish the hard earned reputation and good name of the Chief of Army Staff, these blackmailers will stop at nothing hence all these kinds of mudslinging. It is really worrisome that some people could condescend so low to fabricate baseless allegation against the Chief of Army Staff for reasons that could best be described as mischievous. It is equally worrisome that Sahara Reporters could lend space for this obvious mischief. We really do not believe that it is because the price is right. Consequently, the public and indeed all well-meaning persons should disregard this round of campaign of calumny against the Chief of Army Staff and similar ones because they are baseless and unfounded. For the unscrupulous elements and their cohorts, these campaigns would prod the Nigerian Army and indeed the Chief of Army Staff to continue to serve the nation diligently and with utmost zeal.